Posted at 7:57 am on October 22, 2012 by Lori Z. But, look! She had a tarp and everything. Twitter users also cannot stop slapping their knees and holding their aching sides. Fluke and OFA tears? So delicious. Sandra Fluke attracted *almost* enough people to get slapped with the automatic 18% gratuity at a restaurant. Sandra Fluke attracted enough people that if she took them all to Subway, she'd *almost* have enough punches for a free sandwich. Sandra Fluke's "gathering" could have benefited from the star power of Danny Bonaduce. @AceofSpadesHQ If each of Fluke’s “supporters” had donated a dollar, she would have birth control for a month. 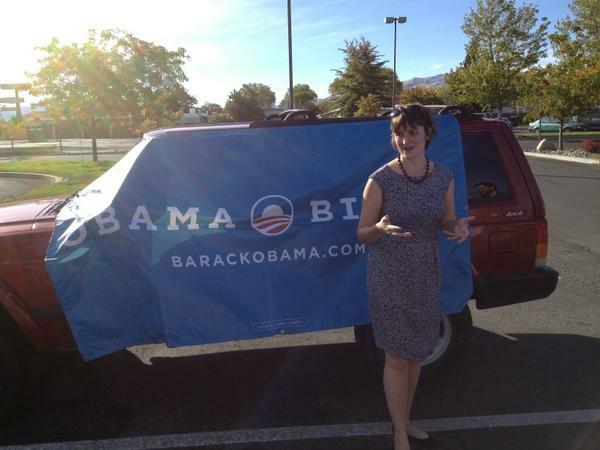 Sandra Fluke's rally was 20 people, and at least one race, short of a race riot. Sandra Fluke's rally had almost enough white people to stage a "Frasier Live!" production. Gut-busting, and it doesn’t stop there. A hilarious hashtag enters the mix, as Twitter users guess what kind of crowd is larger than a Fluke crowd. #CrowdsLargerThanSandraFlukes The number of people who believe David Letterman is still funny. #CrowdsLargerThanSandraFlukes Men who've walked on the Moon. #CrowdsLargerThanSandraFlukes Foreign heads of state to whom Obama has bowed. #CrowdsLargerThanSandraFlukes Comedians who've dared mock Obama. Now, more people are mocking her “rallies” than actually attended! More, please, Twitter.